The results show that for women in their 40s and 50s, the worse their skin wrinkles are, the lower their bone density is. "This information…may allow for the possibility of identifying postmenopausal women at fracture risk at a glance, without dependence on costly tests," said study researcher Dr. Lubna Pal, a reproductive endocrinologist at Yale School of Medicine in New Haven, Conn.
Pal and colleagues studied 114 women in their late 40s and early 50s who had had their last menstrual period within the past three years and were not taking hormone therapy drugs. Women were excluded from participating if they had undergone any cosmetic skin procedures. Women with worse wrinkles had lower bone density than women with smoother faces. This relationship between wrinkles and bone density was evident in all the bones the researchers tested — hip, lumbar spine and heel — and was independent of age, percentage of body fat and other factors known to influence bone density, Pal said. Further, firmer face and forehead skin was associated with greater bone density. Bones and skin share common building blocks — a group of proteins known as collagens, Pal said. 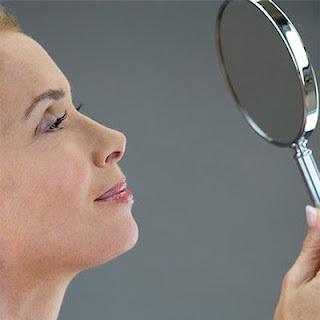 As we age, changes in collagen may account for age-related skin changes, including worsening skin wrinkles and sagging skin, and also contribute to deterioration of bone, she said. Long-term studies are needed to substantiate a relationship between wrinkles and the risk of bone fracture, Pal said. "Ultimately, we want to know if intensity of skin wrinkles can allow identification of women who are more likely to fracture a bone, especially the femoral neck or the hip, an often fatal injury in older people," she said. If this is the case, then including the study of skin wrinkles with other clinical risk factors may allow doctors to identify those at risk even without more costly technology, she said.